Here's where to watch every episode of Grey's Anatomy season 14. Mouseover or tap an episode to see where to stream it. Click or tap the play icon to stream it on the best available service. Break Down the House Sep 29, 2017 Meredith and the team are focused on helping Owen’s sister after her shocking return, and Amelia faces a conflict over a patient. Meanwhile, Bailey is forced to give Grey Sloan a facelift after the fire, and the doctors are introduced to a few new faces that spice things up around the hospital. Get off on the Pain Sep 29, 2017 Meredith struggles to come up with a new plan for Owen’s sister. Jo makes a surprising choice regarding Alex, and Andrew’s sister’s controversial research leads to a shocking discovery. Go Big or Go Home Oct 6, 2017 Harper Avery arrives at Grey Sloan, putting Bailey on edge. 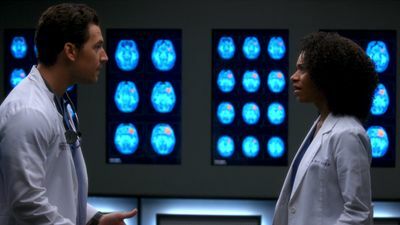 A familiar face from Meredith’s past returns as a patient, and Amelia tries to manage a secret. Ain't That a Kick in the Head Oct 13, 2017 Amelia confronts a difficult situation, while Meredith deals with the fallout from her conversation with Nathan. Maggie finds herself at an awkward family dinner, Jackson receives big news, and Richard and Bailey search for the stars of tomorrow. Danger Zone Oct 27, 2017 In a flashback to Iraq in 2007, the events leading up to Megan’s kidnapping are revealed. In present day, Owen and Megan hash out old wounds. Come on Down to My Boat, Baby Nov 3, 2017 Jackson decides he needs some time off and invites the guys to join him on a day out at sea. Meanwhile, Arizona, April and Maggie treat a woman who’s hiding a deadly secret. Who Lives, Who Dies, Who Tells Your Story Nov 10, 2017 After a roller coaster car falls off the track at the county fair, the doctors at Grey Sloan tend to patients who spark memories about ghosts from their past. The series 300th episode! Out of Nowhere Nov 17, 2017 A hacker compromises the hospital’s computer system, causing monitors, phones, labs and patient files to all go down. As technology fails them, Bailey attempts to keep the peace but chaos erupts and the doctors are forced to get creative in their methods to treat the patients. 1-800-799-7233 Jan 19, 2018 Jo finally faces her estranged, abusive husband Paul Stadler, while Grey Sloan continues to work with the FBI after a hacker has compromised the hospital’s computer system. Personal Jesus Jan 26, 2018 A young boy is admitted to Grey Sloan Memorial and his case has a profound impact on the doctors. Meanwhile, April is faced with a surprising patient, and Jo continues to deal with her estranged husband. (Don't Fear) the Reaper Feb 2, 2018 The stress of managing the hospital and coming to terms with Ben’s decision to become a Seattle firefighter pushes Bailey to her limits. Harder, Better, Faster, Stronger Feb 9, 2018 April is in charge of the new Grey Sloan Surgical Innovation Contest, and the doctors are eager to start their projects. Meanwhile, Catherine’s old friend has a shocking idea for Catherine and Jackson; and Meredith treats a returning patient who inspires her project. You Really Got a Hold on Me Mar 2, 2018 Seattle firefighters Ben Warren and Andy Herrera head to Grey Sloan after rescuing two boys who were injured in a house fire; the doctors work on their projects for the surgical innovation contest; Amelia brings Tom Koracick in to consult. Games People Play Mar 9, 2018 Maggie's relationship with Clive starts to progress; she invites him over for a game night to meet Meredith and Amelia; Meredith and Jo meet with the owner of the patent to the polymer they need for their project, who is a friend of the family. Old Scars, Future Hearts Mar 16, 2018 Meredith tries to learn more about Marie Cerone's history with her mother. Meanwhile, Jo is applying for fellowships around the country and it throws Alex for a loop; and Tom Koracick helps April acknowledge her crisis of faith. One Day Like This Mar 30, 2018 April's crisis of faith is challenged by a patient she treats who is a rabbi, and Meredith treats a patient who is a transplant surgeon from another hospital. Hold Back the River Apr 6, 2018 Amelia, Koracick and DeLuca perform a risky, groundbreaking procedure using ultrasound waves to remove a young patient’s brain tumor. Meanwhile, Meredith and Jo work with different polymers to try to salvage their project submission; and Richard’s AA sponsor is admitted to Grey Sloan with a DNR. Beautiful Dreamer Apr 13, 2018 An agent from ICE shows up at Grey Sloan in search of an employee who may be working in the U.S. under DACA. Alex’s patient Kimmie wants to leave the hospital to enjoy her final days, but Alex feels differently. Meanwhile, Arizona treats Matthew Taylor’s baby and April wants to do whatever she can to help. Judgement Day Apr 20, 2018 During presentations on Grey Sloan Surgical Innovation Prototypes Day, Arizona shares cookies from an appreciative patient that, unbeknownst to her, contain a special ingredient. Meanwhile, Catherine reveals shocking details to Jackson about his grandfather's past; and Jo steps in mid-operation on a major surgery. Bad Reputation Apr 27, 2018 The hospital brings in crisis management to help them sort out allegations against Harper Avery. Nurse Olivia shows up at Grey Sloan with her son, throwing Alex and Jo for a loop Arizona decides to spend more time with Sofia who is having a hard time at school. Fight for Your Mind May 4, 2018 Alex and Jo go on a road trip to Iowa to find Alex’s mom, whom he hasn’t heard from in a very long time. Meanwhile, Meredith gives a presentation on her mini-livers project, which attracts a ton of attention; and Jackson works to rebuild the foundation after its reputation is threatened. Cold as Ice May 11, 2018 One of Grey Sloan Memorial’s own is seriously injured, making the team reflect on what is truly important to them. Meanwhile, Nicole Herman pays a visit to Grey Sloan and talks to Arizona about an exciting opportunity. All of Me May 18, 2018 Meredith Grey and the team of doctors at Grey Sloan Memorial are faced with life-or-death decisions on a daily basis. They seek comfort from one another, and, at times, more than just friendship. Together they discover that neither medicine nor relationships can be defined in black and white.